Mars-Chroniken - Löst verdampfendes Wasser trockene Lawinen auf dem Mars aus? Wörner: "AVIO is a key player in future European projects" Battiston: "A company that rivals SpaceX" Ranzo: "The future is in liquid propulsion"
Colleferro, 3 May 2016 – The Director General of the ESA (European Space Agency), JanWörner, paid a visit to AVIO, together with Roberto Battiston, President of the ASI (Italian Space Agency). The guests were greeted by the CEO of AVIO, Giulio Ranzo. The ESA delegation also included Gaele Winters, Director of Launchers, and Stefano Bianchi, Head of Launchers Development. The visit to the AVIO facility coincided with Space Propulsion 2016, an exhibition/conference running until 6th May at the Marriott Hotel in Rome. Organised by the 3AF (Association Aéronautique et Astronautique de France) in cooperation with the ESA (European Space Agency) and the CNES (Centre National d’Études Spatiales), this event is taking place in Italy for the first time. Space Propulsion brings together leading experts from the European aerospace scene. It is held to support the preparation of future activities as well as the space propulsion action plan. Giulio Ranzo presented the company to the delegation, emphasising that AVIO is a leading international group in the space launcher sector and in spacecraft propulsion and space travel. It has 5 sites in Italy, France and French Guiana, and employs over 800 people. In 2015, it generated about €280 million in revenue (compared to €220 million in 2014). 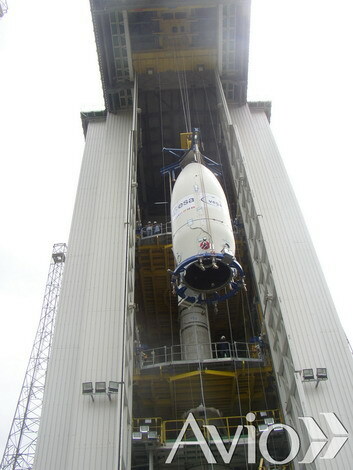 The AVIO Group manufactures the VEGA launcher, with its subsidiary ELV (30% owned by the Italian Space Agency) as prime contractor. This makes Italy one of the very few countries in the world able to produce a complete space launch vehicle. AVIO will build the new VEGA C launcher and will contribute towards building the new Ariane 6 launcher by fitting both launchers with a newly designed solid propulsion engine, while also providing Vinci and Vulcain liquid oxygen turbopumps for Ariane 6. The new solid propulsion engine, named P120C, which will be fitted to the new European launchers, Ariane 6 and VEGA, will be developed and built by Europropulsion (J.V. 50% AVIO, 50% ASL). To create the P120C and the new Zefiro 40 engine (built and tested in Italy, which will be the second stage of the VEGA launcher), a new composite material made of pre-impregnated carbon fibre will be used, made directly by AVIO in its research centres in Colleferro and Campania. Giulio Ranzo, the CEO of AVIO, commented: “We are honoured to have welcomed this visit from the ESA and its Director General, Jan Wörner; we were able to showcase our products up close, notably the VEGA launcher and the engines for Ariane 6. Our guests were able to see the result of AVIO’s investments first hand as well as the new production plants that will be home to our manufacturing for Ariane 6 and VEGA, whose construction work is already underway. We were also able to show our guests the recent developments and success we are achieving in liquid space propulsion, particularly with methane-LOX. We are convinced that space propulsion of the future will hinge on this very field”. Mr Ranzo also accompanied Mr Wörner as he visited the production plants for the boosters for Ariane 5, focusing on the departments where thermal protection is applied and on the plants working on VEGA, including the filament winding for the innovative carbon fibre engine casings. The large sizes of the manufactured components and the complexity of the work require huge machinery and vast warehouses located in different areas. Therefore, to make it easier to view the various manufactured components, an exhibition featuring certain parts from the VEGA and Ariane programmes was set up inside the production areas. For VEGA, parts of the nozzles from the second and third stages could be admired (Z23 and Z9), while for Ariane 5, parts of the igniter were on display. They are entirely made in Colleferro by highly specialised staff. The Turin-made liquid oxygen turbopump for the Vulcain engine was also on display for Ariane 5. AVIO also gave a glimpse into the future, exhibiting several components that it’s developing for liquid fuel propulsion systems. Efficiency and “Green” propellants are the main reasons why AVIO is investing in cryogenic liquid propulsion. Based on its prior success with liquid oxygen turbomachinery (the Vulcain’s liquid oxygen turbopump), over time, AVIO has launched the development of the MIRA engine for the third stage of the upcoming VEGA E launcher. The engine, for which AVIO developed the liquid methane turbopump and the injection plate, was successfully tested in 2014. In recent years, AVIO has also been developing the engine’s combustion chamber through its R&D projects. It has been investing in both traditional technologies (HYPROB) and in innovative technologies such as Additive Layer Manufacturing (SMSP - 3D Printing). The latter is also highly promising in light of the latest successful fire tests for the combustion chamber and injection plate prototypes. Roberto Battiston, President of the Italian Space Agency, commented: “AVIO is an Italian success story with a great future. Mr Wörner’s visit, the Director General of the ESA, confirms that Colleferro is fundamental for European space exploration. This site will produce the new generation of efficient, reliable and competitive European launchers. The way in which AVIO innovates, designs and develops its products means this company can rival SpaceX”. The Director General of the ESA, Jan Wörner, said: “I came to Colleferro to see how the work was coming on for the major upcoming European projects involving a family of launchers that will include VEGA C and Ariane 64 and 62: it was really impressive to see how the boosters are produced here at AVIO”. Colleferro, 9 March 2016 – The European launcher Ariane 5 has successfully completed its 85th mission, sending the EUTELSAT 65 WEST A satellite into orbit. 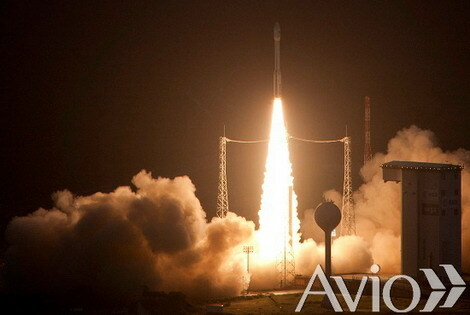 The mission lifted off at 02:20 AM local time, 06:20 AM in Rome, from the Kourou European Space Centre in French Guiana, and lasted for a total of 27 minutes and 23 seconds. EUTELSAT 65 WEST A was correctly placed into a geostationary transfer orbit. 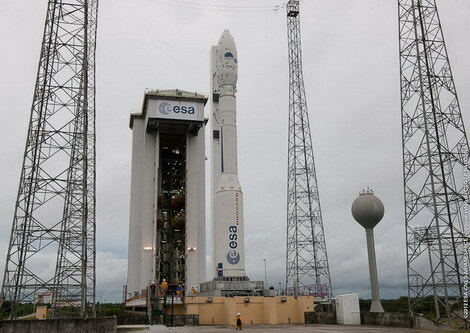 EUTELSAT 65 West A is the 31st satellite launched by Arianespace for satellite operator EUTELSAT. This tri-band satellite was built in California by Space System Loral (SSL) and designed to meet the increase in market demand for video and broadband in Latin America. Its powerful beam in KU band enables DTH (direct-to-home) reception of digital channels and HD reception in Brazil with 60 cm satellite dishes, and will make it easier for businesses in Central America, the Caribbean and the Andean region to get an internet connection.